Published September 28, 2011 By Anna T. This post may contain affiliate links. Regardless, I only recommend sites I've researched and/or used and trust. Westat work from home jobs often involve placing outbound calls to people in order to collect data. They are a social science survey research firm. This is a company that most people have had pretty good experiences with, but please keep in mind that they may or may not be actively recruiting workers at the time of this blog post. Still, it's one to definitely keep an eye on if you are OK with outbound calling as this company does have a good reputation. How much do Westat Work From Home Jobs Pay? Westat pays $8.25 per hour for English speaking telephone interviewers. If you can speak both English and Spanish, you can get $11.60 per hour. Payments are made weekly on Fridays via either direct deposit or US mail. If it's possible to sign up for direct deposit, that would be your best bet because it will ensure you get your money faster. If you are hired by Westat, you'll be working as an employee, not as an independent contractor. This means you will be eligible for many benefits. What benefits does Westat offer? Westat work from home jobs offer group insurance, 401K, a staff bonus plan, employee ownership, and professional development reimbursements. The latter means that you can take advantage of educational programs and in-house technical training at Westat's expense if those options become available to you. You will not be eligible for the benefits until you've worked the minimum number of hours you were scheduled for. 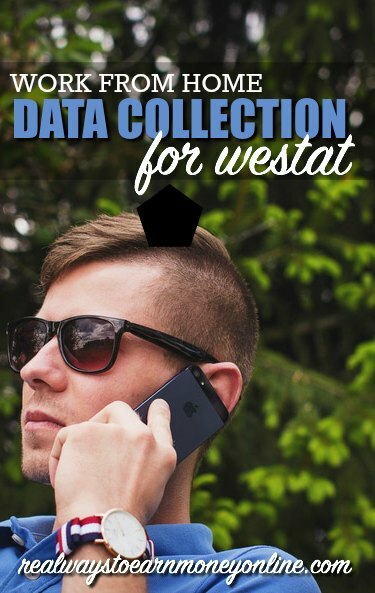 Do you need prior data collection or experience with phone work to apply at Westat? No, no experience is necessary. Westat will train you to do the job if you are hired, and you will also be compensated for your training time. The training may take about three days. What kinds of surveys do you conduct at Westat? The surveys vary in nature, but they are generally concerning things like healthcare, statistics, and education. If you have done phone work before that involved outbound calling, then you already know that some people are not willing to talk to you and will immediately think you are a telemarketer even though that is absolutely not what you are doing. For this reason I'm guessing the work here could be challenging if you aren't used to that sort of thing. You need high-speed internet, a headset, and a landline phone. Doing this job also requires no background noise in your house while you work. You will also have to undergo a fingerprint check and a criminal background check before being hired to work from home. These cost a little money and you'll have to pay for, but they will reimburse you for it. You have to agree to a minimum of 15 hours per week. You work part-time, but up to 40 hours per week is possible. Your schedule may change weekly depending on Westat's needs, but your personal needs will also come into play when your hours are determined. There are different projects going on at different times, and when one project ends, you may or may not be able to get on board with another. Is the work at Westat consistent? Sometimes there may not be a lot of hours available for you to schedule yourself for, although it seems that most people who work for Westat say the work is fairly consistent. Still, I would recommend having a backup job. You just never know. It's scary to depend on just one source of income. What do most people think of Westat work from home jobs? There are plenty of Glassdoor reviews on the at-home data collection jobs here. If you don't feel like reading, the majority of people actually enjoyed doing the job, but then there were some who complained that pay is too low with no raises. I also saw several complaints about inconsistency of work. Apparently you can be put on a project for months, but when it ends, you may not have anything else to do for a while. Visit their careers page. Under the “Location” field, just scroll down until you see the option for US – Home-based telephone work. Select that, and you'll be taken to a screen with their home-based data collection jobs. Keep in mind that their staffing needs change, so if you are not able to apply right now, you may be able to at a later date. You'll have the option to search either home-based or for work in your area (which wouldn't be home-based). It’s a fun experience because you talk to many people while you are surveying them. Great and fun way to supplement your income. This looks like a great opportunity, I am supprised that it is not just oursourced to India. Sounds like a great work-at-home opportunity. Love that it’s not an independent contractor position and that they offer benefits! I don’t believe I’ve heard of this company, but it definitely sounds promising.